The Landis Farm Guest House is centrally located in Lancaster County, home to PA Dutch Country attractions and shopping. Our location also offers easy access to Spooky Nook, Hershey, Harrisburg, Gettysburg, Philadelphia, Longwood Gardens, and more. The Guest House was built in the late 1700s and fully restored in 1976. It features pine floors, a large walk-in fireplace, and an “Indian Door.” The woodwork is painted with authentic Williamsburg colors. The Guest House sleeps up to six people. There are two bedrooms upstairs (one queen-size bed and one full-size bed) as well as a full bathroom. Downstairs, a sofa opens to a queen-size bed. A pack-n-play and an inflatable mattress are also available. While the Guest House is rich in colonial charm, it also provides updated amenities, including a full eat-in kitchen with a sink, refrigerator, oven, stove, microwave, and coffee maker. See the full list of amenities below. Jeff and Deb purchased the farm from Deb’s parents, Earl and Evie, in 2016. 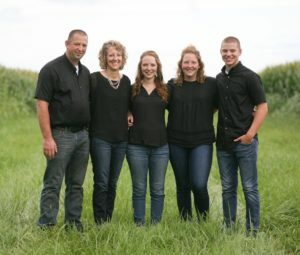 They, along with their three children, Colleen, Corissa, and Jeremy, are the third generation to live and work on the farm. Jeff is currently self-employed selling Snap-on Tools and Deb works part-time at Doe Run Elementary School. During high school, Jeff worked on a farm, while Deb grew up at Landis Farm. The couple enjoys meeting new people and sharing the farm with others. Check our availability online and make a reservation today.